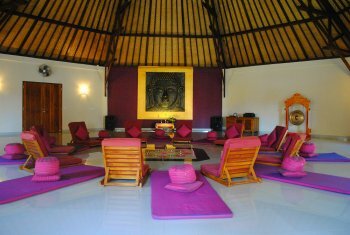 Tantra Holiday on Bali "Like in Heaven on the Island of the Gods"
Mindfulness, tantric rituals, massages, laughing together, new visions, meditations and many exercises for body, mind and soul. 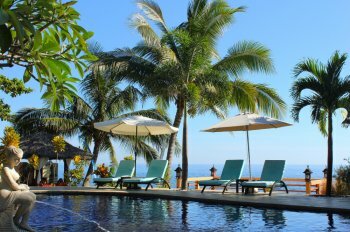 Including a Sunrise Dolphin Tour and Balinese Massage! Bali is also called the “Island of Shamans“ or “Island of Gods”. Beyond the touristic paths, there are many ways to travel in a different way, inhale the "spirit" of the island and arrive in the moment. There are numerous temples which invite you to be visited, secluded beaches in the north, enchanted jungle environments in the interior of the island and fascinating coral reefs off the coasts. Situated in a tropical garden paradise on the north coast of Bali, directly on the seafront, you will find the Holiway Garden Resort and SPA. “Holiway” stands for a holistic way of life. 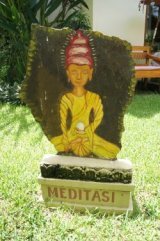 In this context, there are a variety of interesting offers for your body, soul and mind – to bring you back into balance. On the other hand, the pool, the restaurant and other places are ideal for laughing, making jokes, chatting and being in nice company! See www.holiway.net. In this seminar, there will be a combination of tantric exercises and rituals, laughter yoga, mental training, vision work, rebirthing sessions, meditations and elements of tantric massage. You will find time to become aware of yourself but also meet like-minded people and have lots of fun. The seminar is suitable for beginners as well as for advanced participants. Couples as well as Singles are welcome! „Like in Heaven on the Island of the Gods“, this is the title of our seminar on Bali. This video will make you understand why. Have a look!